I would like to introduce Japanese Calm Soup, Hamaguri no Ushiojiru. The reason why I introduce it today is that March 3rd is the celebration day for girls called “Hinamatusri.” People celebrate with hoping girls will grow up healthily, and decorate dolls and have a good meals. Young man and woman are on top of stage. They are nobles in ancient time. The root of this celebration is not clear and several story are said. One is saying that it was that noble girls were playing with dolls since Heian period (794 – 1185). And in Edo period (1603 – 1868), it became general. So it has long history and still now people continue. The photo on right is taken by my friend. Families who have girl(s) decorate this Hina Ningyo at home. The typical dinner at this day is Chirashi Sushi and Hamaguri no Ushiojiru (Clam soup). Every clam has 2 shells and this combination is unique. Each shells cannot fit perfectly with other one’s shell. From this fact, parents hope that their girl(s) will find good partner in the future. Also foods of Hamaguri are often served at wedding party. 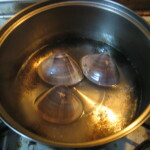 1) For preparation, put clam in salt water (about 3%) for 30 to 60 min. to make clam spit out sands. 2) Put water (450ml at this time) and kelp in a pot and boil. 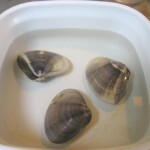 Once it boiled, pick out kelp then put clam. Boil it on a low heat. 3) When clam opened, pick put it. If there are some lye, pick out them. Then put some sea salt and soy sauce as your favorite taste. * not boil clam well. Half boiled calm will be better. 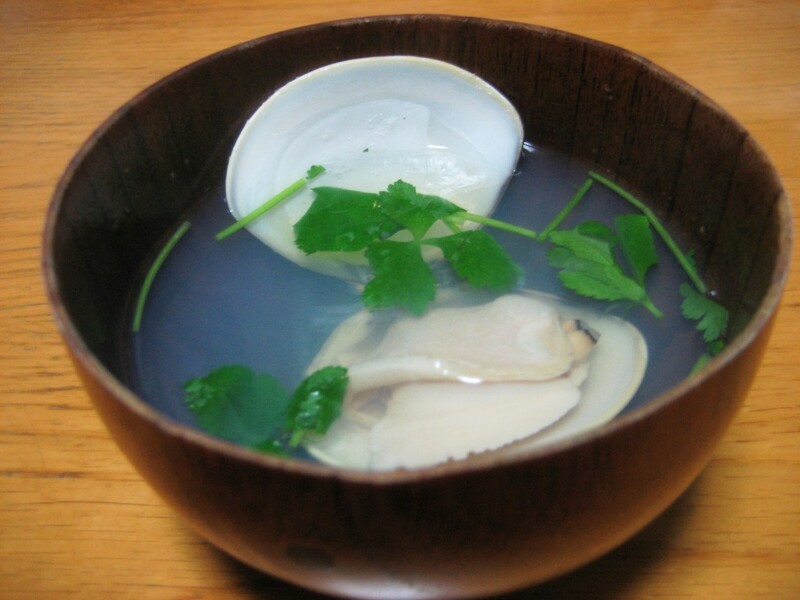 4) Put one clam into each cup and pour soup, and put mitsuba on it. Soup is a little bit white, it is from clam. This soup is very light taste. Some people may think it is tasteless. I think this food is one which we should enjoy taste that the food stuff (clam) originally has. “Umami” comes from kelp and it support to find taste of clam. Many Japanese foods are designed to enjoy taste which food stuff originally have. I think “Hamaguri no Ushiojiru” is a typical one.